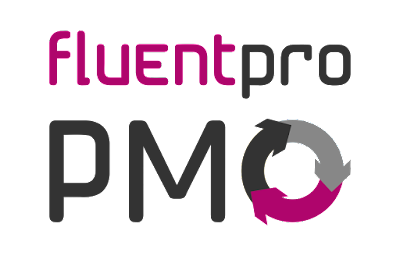 Starting June, FluentPro Software, a Microsoft Gold Partner offers creation of trial O365 tenants with Microsoft Project Online and one of our ready-to-use PMO configurations deployed. Trial Project Online PWA will have PMO configuration deployed and small set of sample data uploaded as well. 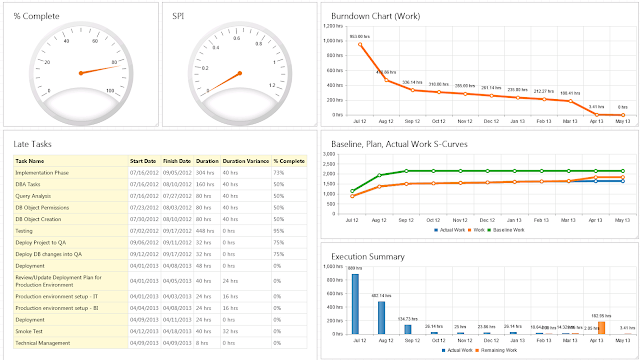 Both configuration come with sample reports, dashboards and FluentPro EPM Pulse. When using Microsoft Project Online, organizations do not have to worry about the disaster recovery as it is handled by Microsoft for entire PWA. But - administrative Backup and Restore is not available in a Project Online environments as standard feature. 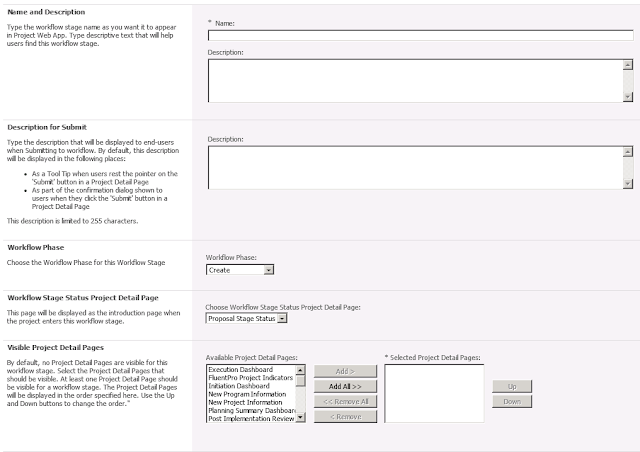 If there is a need to roll back project plan to previous version - it is quite impossible to do (alternatively users can keep backup copy locally). FluentPro has developed and released a product, FluentPro Backup for Microsoft Project Online. on-demand backup / scheduled backup with multiple schedules. Service is available as an subscription at $149/month plus $0.99 per GB for storage over 5GB. We use secure Microsoft Azure infrastructure for running all services and storing backup data. The retention policy is unlimited for active customers, we provide ability do download backups, they are compatible with FluentBooks format. FluentPro Software Corporation announced today at the PMI Global Congress the official launch of a FluentPro PMO Free Edition, a ready-to-use, pre-configured PMO (Project Management Office) solution for Microsoft Project Online / Project Server 2013 platform. This free edition is a great addition to FluentPro PMO family and helps customer get better experience from Microsoft Project Online. Configuration deployed to PWA automatically by FluentPro's state-of-the art provisioning system based on FluentPro FluentBooks technologies and comes with 3 month unlimited subscription of EPM Pulse, our data visualization platform for Microsoft Project Online. Visit our website and contact us. FluentPro Software Corporation is a leading software development and Project Server / Project Online implementation company. We focus on optimizing the way how companies work with Project Online / Project Server by bringing best available technologies to the companies. We enable you to manage configuration, migrate data and configuration as well get all the best from Project Server including resource management, portfolio management, IT portfolio management, business intelligence. I've spent couple month without paying too much attention to my blogs - was busy implementing some organizational changes, products portfolio changes and preparing new product launches here at FluentPro Software. From now, I promise that will create couple blog posts every month. 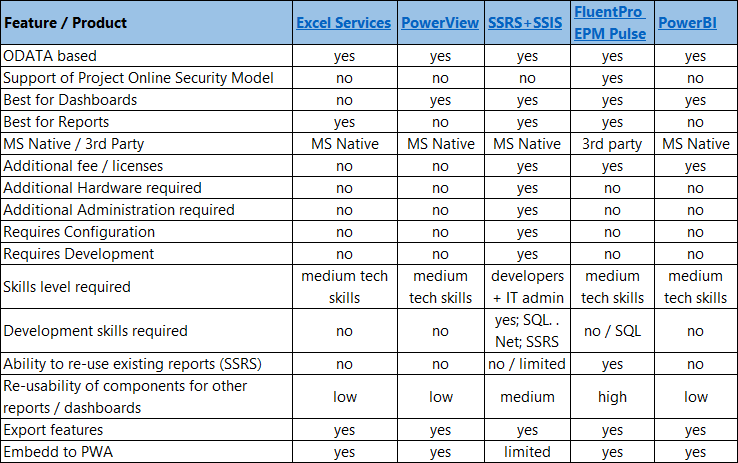 In this post, I will provide high-level overview of existing reporting options for Project Online with some comparison. We will include our products but will try to be objective as much as I can :-) and will provide overview of the existing technologies / platforms. If there is another technology - we would be more than happy to include into this comparison. Standard reporting feature. You use Excel to get OData Feed and then using Pivot Tables you can transform the data. Great for 90% of tasks, but remaining 10% when you need to present data in some specific way require a lot of work, using hidden sheet, referencing cells etc. You can buy pre-built reporting packages from several PPM Partners. Great and quite easy tool to create interactive dashboards. Great for 90% of tasks, but for remaining 10% it is impossible to present data in some specific format. For example - value of 1 field with some formatting. 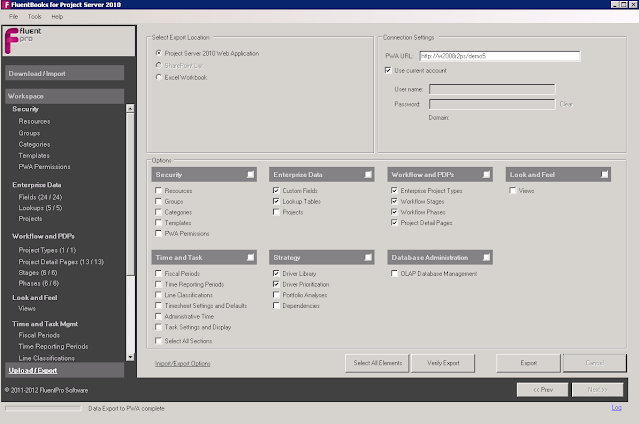 Using SSIS users can get ODATA feed and get it to SQL database. This bring ability to create datawarehouse and sync data from Project Online to it. 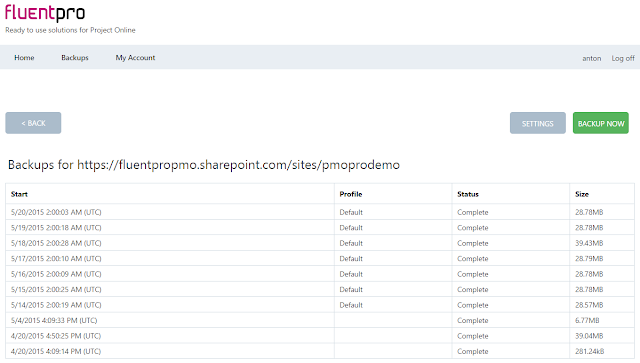 Then you cna use full stack of reporting tools (for example SSRS). Unfortunately, reporting DB structure is not 100% matching OData feeds, so it requires re-working, mapping and other development activities to make Project Server SSRS reports working with this data. At minimum, your are required to create/buy VM with SQL Server, configure SSIS; SSRS in native mode, create DB, deploy and change SSIS packages, and schedule them to run. 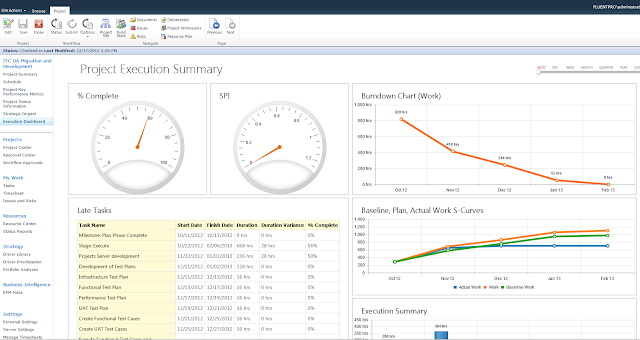 Then you need to move / change your SSRS reports. SSRS reports can be embedded into PWA pages but there is still a challenge of double authentication - one for Project Online and one for VM + you need to manage security since VM is internet-facing. Disclaimer: We are subjective here since it is our product and we believe it is a great product. With EPM Pulse users can build portfolio and project level dashboards using a "drag-and-drop" approach. EPM Pulse is based on "widgets", every widget is a chart that can be added to dashboard to show pre-defined information. IF needed, users can extend system by creating new custom widgets / modifying existing ones and this requires basic SQL knowledge; All widgets are re-usable; being created once can be used on multiple dashboards and moved to other PWAs. EPM Pulse supports rendering of SSRS reports and since we use data schema that is very close to Project Server Reporting DB, it is possible to use same reports from on-premises with only one minor change - adjusting naming of parameters. Latest and greatest powerful data visualization platform from Microsoft that can pull data from multiple sources. Supports big volumes of data. Great for creating high-level "picture". Requires additional subscription. 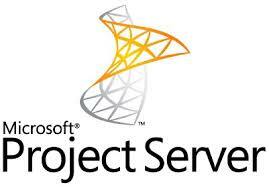 Our team migrated Solution Starters for Project Server 2010 to the Microsoft Project Server 2013 platform. We are distributing Solution Starters for Project Server 2013, free of charge, available for download with source code and with wps, ready for deployment. Please note - solution starters are available as-is, free of charge and FluentPro Software Inc, FluentPro Software Corporation are not responsible for any direct and indirect damage. Please try / install solution starters at your own risk. You can download solution starters from our website - http://www.fluentpro.com/solutionstarters2013.html . During this this period number of our customers successfully migrated their Project Server 2010 environments from on-premises to the Project Online without any problems, issues and errors. This was a great month for FluentPro - and thank you for the trust! This is a part 3 of my series of post related to the project life cycle design and data visualization with the help of EPM Pulse. In this part, I will provide an overview of the process of building portfolio-level dashboards with the help of FluentPro EPM Pulse. Portfolio is a group of projects. Organization can have several portfolios or only one that will contain all the projects that should be performed over a specific time frame. Projects can be included into the portfolio directly or using the Portfolio Analysis features of the Microsoft Project Server platform. Portfolio dashboards display aggregated information about set of projects and how entire portfolio aligned with goals. Using these widgets companies can visualize the state of their portfolio and what is the the most important - do some additional analysis and slicing/dicing of the data. 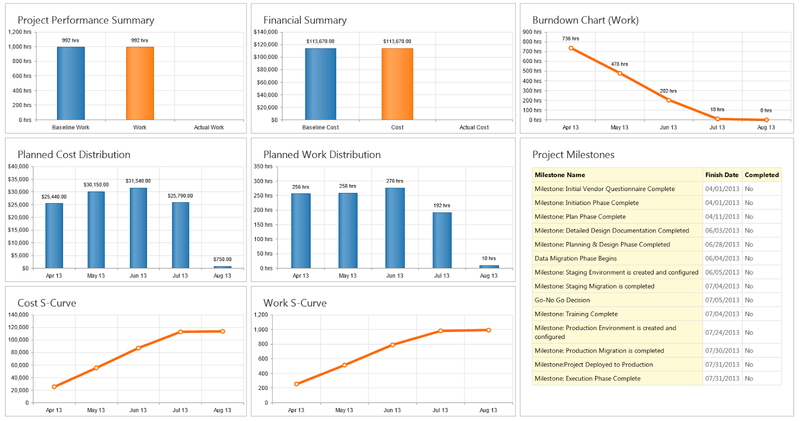 EPM Pulse has a powerful tool for navigating dashboards in a time - Timeline control. It is visible on all dashboards and in all modes. Changes made to the timeline and project filter will be saved to the dashboard if in the edit mode. - Custom (users can define custom range). Note: Majority of the widgets are time-enabled, but there are some that are not - mostly ones that display summary of financial / work information for the entire portfolio. In the description for each widget user can find if it is not time-phased (this is specially stated on one's that are not timeline-enabled). 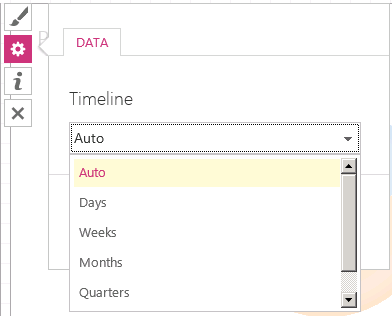 Depending on timeline selection, widgets will use appropriate time scale, but user can override this by using the Timeline setting for the widget (where it is applicable). For example - user might want that Work Distribution widget will be always show data grouped by week, no matter what selected on the timeline. We've created several sample Portfolio level dashboards - and as you will see they might be quite different. 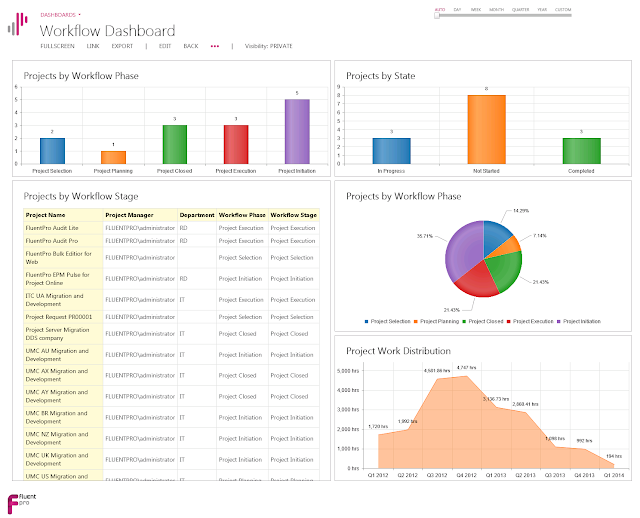 If required - users can change dashboards in minutes and without any programming, anytime. After building 4-5 dashboards, creation of a new dashboard that contains about 10 widgets should take about 4-5 minutes. We recommend that users create a filter for projects - that filter settings saved into dashboard and will be used by default when user not overriding them in the dashboard. Please note that dashboards must be made "public". This was a final post on this series. 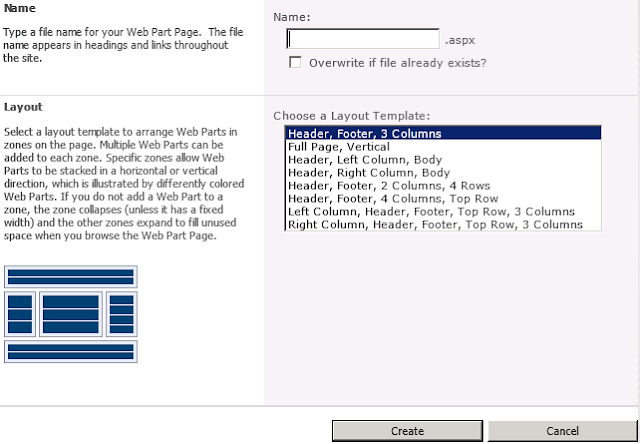 Please visit our blog for the new posts - soon there will be very similar post for Project Server 2013 platform, and instead of Dynamic Workflow solution starter we will use SharePoint Designer 2013. We would like to invite you to our webinar on about benefits of using EPM Pulse and Project Server 2010 together. Webinar will take place on June 11th at 9AM PST; You will learn more about EPM Pulse and creating a portfolio and project level dashboards. Please sign up here - and it is absolutely FREE. In this post, I will provide an overview of FluentPro EPM Pulse, overview of widgets in EPM Pulse that we've created and will show how to build project dashboards in EPM Pulse and integrate them into PDPs and Project Sites. In the next post - Part 3 - I will demonstrate how to create portfolio level dashboards with the help of EPM Pulse. So Let's not wait any longer and let's get stared. FluentPro EPM Pulse is a data visualization platform for Microsoft Project Server 2010 with a focus on self-service. 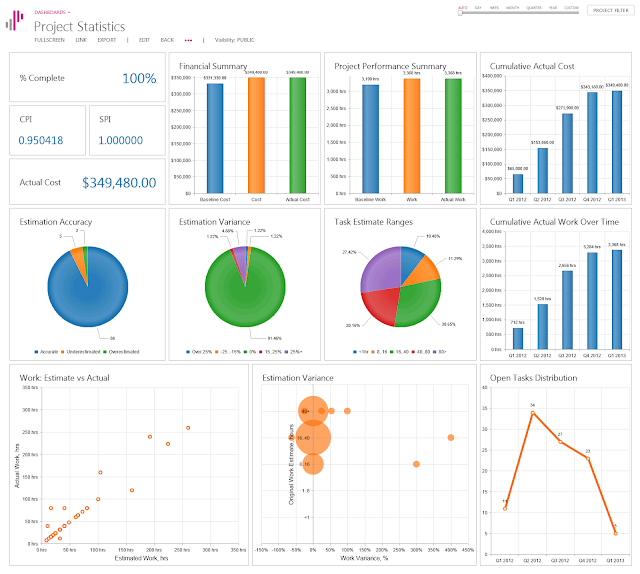 That means that companies can give rights to regular project managers to create their own dashboards for that their projects so project managers can not only "feed" system with the data but also retrieve it and visualize in very easy way using visual tools. 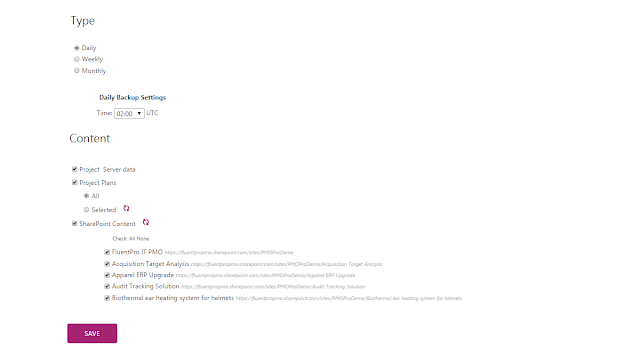 There are 2 main features of EPM Pulse - they are pre-built "Widgets" and Visual Dashboard Designer. Designer allows to add pre-built charts (we call them "Widgets") to the dashboard and re-position / resize them the way user wants. 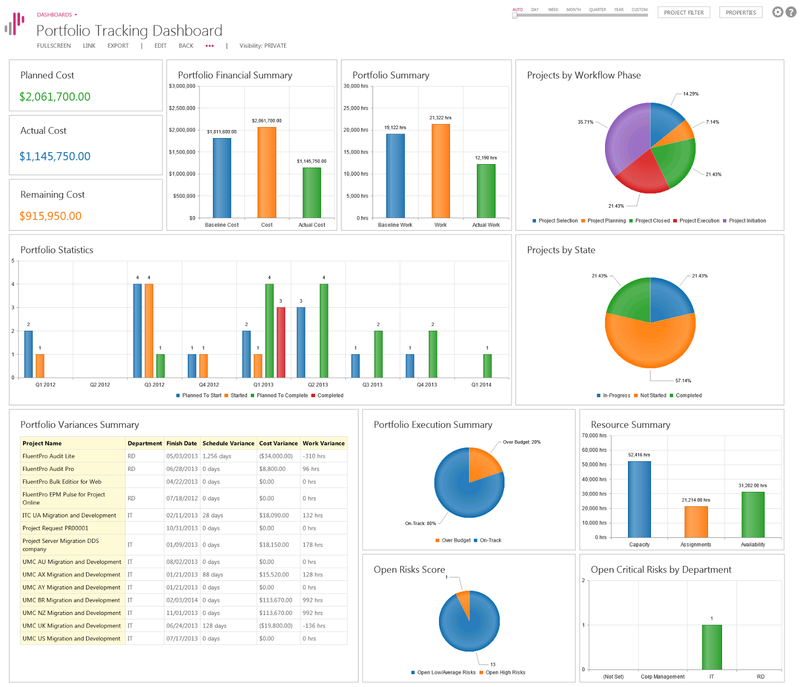 We have built over 150 widgets for both portfolio and project level dashboards and it should cover 99% of all organization needs. 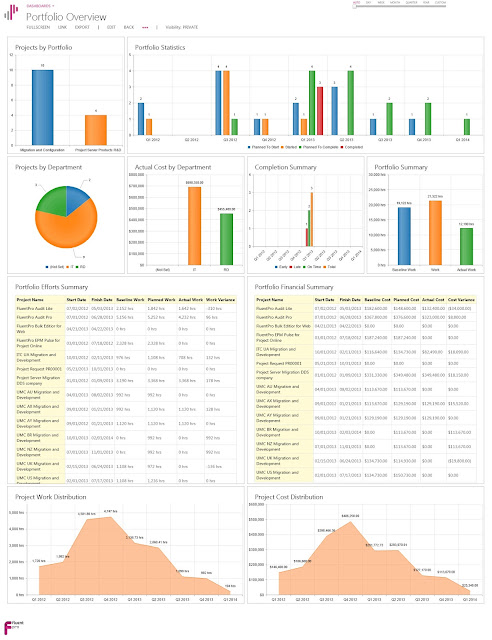 Using widgets provides the ability to build dashboards without any development. Add Widgets. Re-position. Re-size. Save. It all takes just couple minutes per dashboard and seconds to make changes if required. On this stage, companies have only high level information about the project and a limited amount of information. Project schedule might exist but might contain only several tasks or proposed key milestones. There is usually some indication of the requested budget. Project is resourced with resource plan. To create dashboard, click on a Link to EPM Pulse, Select project table and click on "Create New"
This will bring the new dashboard window. 2. 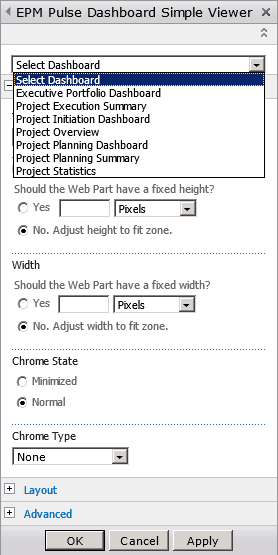 Click on Add Widget and add one more Project Field Widget from Other tab; Click Apply button. 4. 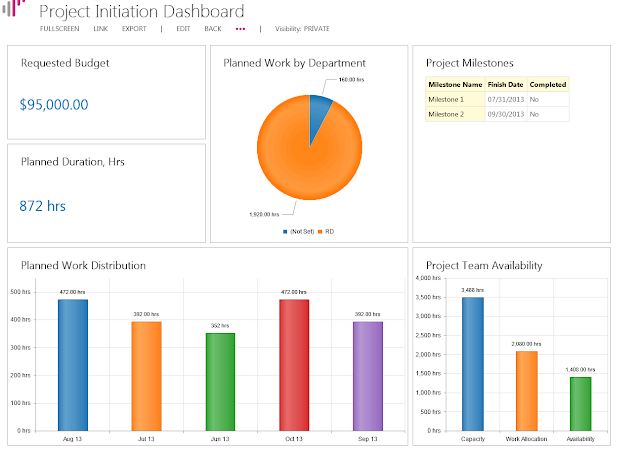 Click on Save and enter the name "Project Initiation Dashboard"
On the next stage, Project Planning Stage, we should be focused on the project schedule / milestones, work / cost distribution and resource availability. We will use the same approach for creating dashboard but will use slightly different set of the widgets. Feel free to add / replace charts or create one more dashboard for this stage. Note: Do not forget to make dashboard public - this will be required to add them to PDPs. On this stage we need to see in-flight information. Progress. Late tasks. Milestones. Again - use creativity - EPM Pulse provides access to over 70 widgets, build multiple dashboards. On this stage we recommend displaying summary metrics from project how it was executed and perform a "lessons learned" analysis on the project. What went wrong? What was great and accurate? What can we improve with next projects? We've developed a number of widgets for that as well - users can find multiple widgets focused on accuracy and variations that serve the best for these goals (for sure, we can display only what can be "measured", this is just one aspect of "lessons learned" or retrospective review). Now - we have 4 dashboards created and we can add them to the PDPs that we already have. Go to Server Settings - Project Detail Pages and click on Project Initiation Dashboard PDP. Go to the EPM Pulse Viewer webpart on the page and click on Edit Webpart and in first dropdown select Dashboard that we created (Project Initiation Dashboard). That's it. 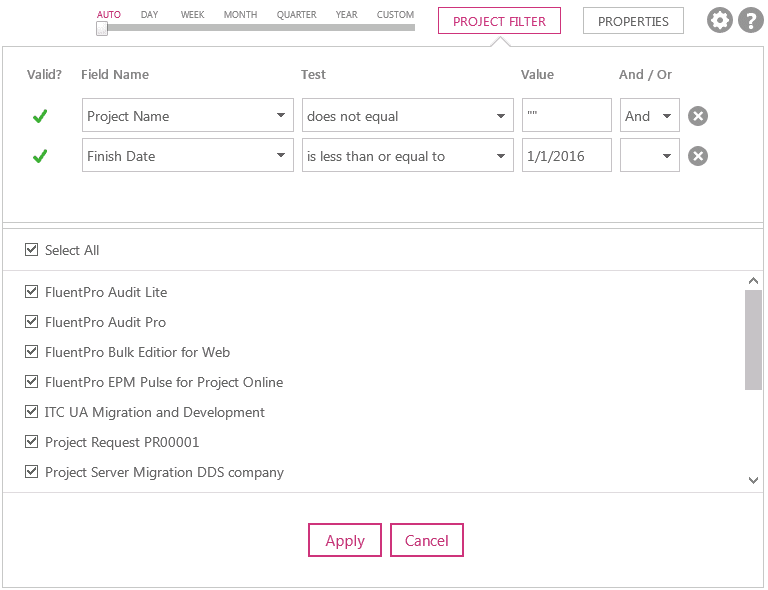 Perform this step for all PDPs and now projects will display EPM Pulse dashboard on one of the PDP depending on project workflow stage. Wasn't that extremely easy? Isn't that looks good? I would say - awesome! We would like to invite you to our webinar on about benefits of using EPM Pulse and Project Server 2010 together. Webinar will take place on June 11th at 9AM PST; You will learn more about EPM Pulse and creating portfolio and project level dashboards. It this post, I will try to provide a step-by-step instructions how to a full create environment with simplified workflow using Dynamic Workflow solution starter and later in next post we will visualize information using dashboards created in EPM Pulse. This will be a pretty big post - but it will allow users to get started with Project Server 2010 with workflow and great data visualization. Be prepared for some reading and couple hour of manual creation of configuration elements in Project Server (if you do not use FluentBooks for Project Server 2010). In my case, the URL with PWA where it will be deployed is http://w2008r2ps/demo2. We strongly recommend to run RestartServices.bat after Dynamic Workflow solution starter install. This will restart IIS and Queue services. In the window that displayed you should see the DM DynamicWorkflow - that means it was installed and we expect it to be functional. - Strategic Impact On this phase / stage, project request is initiated by users; All requests are captured so they can be later prioritized and only selected projects will go to detailed planning / execution. On this stage, initial planning is performed. - Project Selection Dashboard On this stage, the portfolio analysis component can be "plugged-in". In our scenario there will be no portfolio analysis, and only projects that are selected will move to the next stage. - Statistics Dashboard Project is closed. This is the terminal stage of the project. As you can see, I've listed all the Phases, Stages and PDPs that will be visible on those stages - and to make system more flexible, we will have different sets of PDPs for each stage. There is one element that is missing in this table. 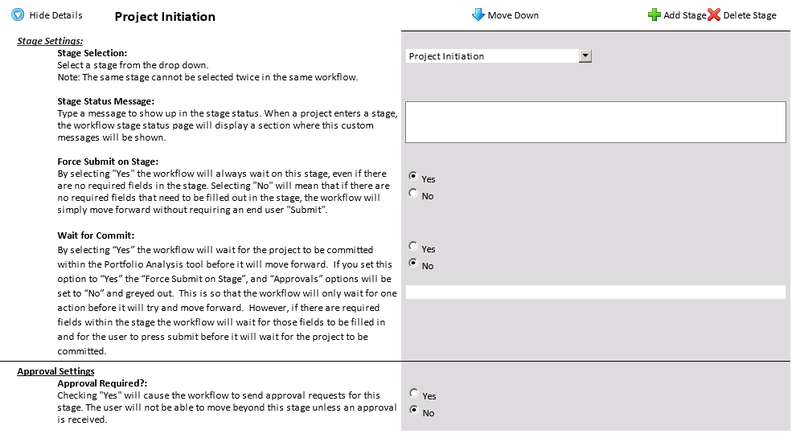 It is possible also to control a "read-only" status of fields on specific workflow stages. Again, for simplicity, in this scenario we will make all the fields read-only on Project Closing and Project Closed stages. So, our workflow structure is defined (designed), now we will get a technical section - creation of all elements. For our scenario - I will create 4 drivers and we will prioritize them - so we can define in future strategic impact for each of the projects. To create drivers, to to PWA and click on Driver Library link in main menu on the left. Please note that you should define and create your own drivers that are specific for your organization. Then click on Prioritize Drivers and system will walk you via several steps of prioritization, depending on number of drivers included. - for "normal" PDP Pages select Project Web App -> Project Fields Webpart and select click on Add button. Webpart will be added to the PDP. 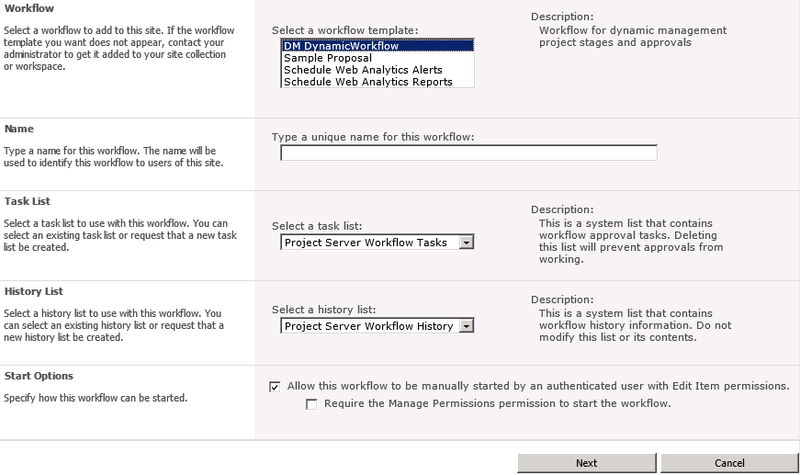 To create Phases, go to Server Settings -> Workflow Phases and click on "New Workflow Phase" button. In displayed window, enter the name of the Phase, Description ( Optional) and click on Save Button. Enter the Stage Name, Select appropriate phase and select and add PDPs that should be displayed on this Stage. At the bottom, you can select fields that should be required and read-only. Click on Submit button - your workflow is ready to be used. Next step in our configuration is creation of EPT - Enterprise project type. EPT is a special "package" that defines what attributes should carry the project and combines all together workflow, project file template, project site template and set of PDP pages (for non-workflow project types). We recommend to create a new project type that will be used to create projects with workflow that we designed but you can update any existing PDP. Project Server Administrators can change Enterprise Project Type for project at any time if that's required as well as restart the workflow. 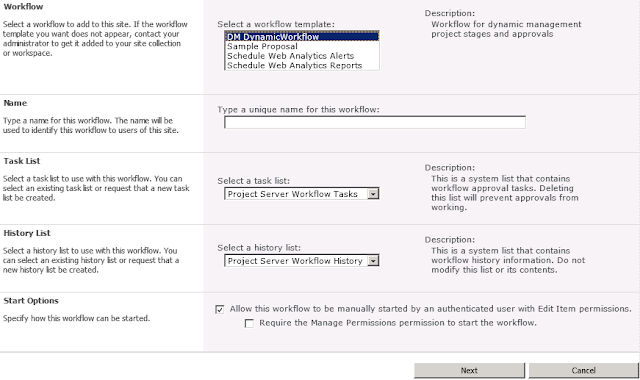 To create new EPM to to Server Settings - > Enterprise Project Types and click on "New Enterprise Project Type" button. 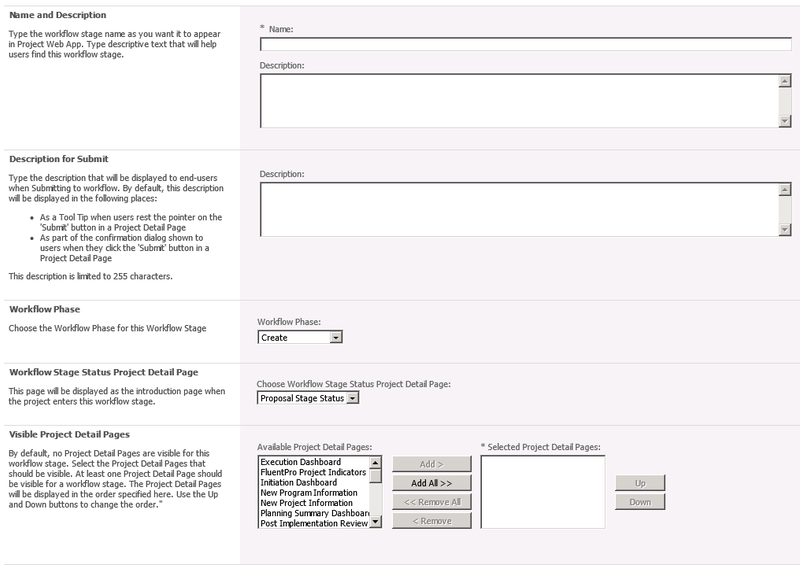 In displayed window, specify the Name of new EPT, Workflow name that we create on previous step, Project Plan and Project Site template (if any custom will be used) and click Save button. I created EPT called FluentPro Project. Our new EPT will be created and now we can start creating our projects and moving them to specific stages using Submit button on Workflow Status Page. How to save time and not create everything manually? You can download trial version of FluentBooks for Project Server 2010 and FluentBooks workspace that contains all elements except workflow. Using trial version, you can upload this workspace and it will create all elements in your PWA. 5. Click on the button "Select All Elements"
6. Enter URL of your PWA and credentials (if you current user has admin rights, you can use "Use Current Account"
7. Press Export button and FluentBooks will upload all the configuration. You will save at least 2-3 hours of your time with using FluentBooks - and this trial version is absolutely free. Note: There will be no workflow created yet; after you create a workflow please update EPT and select workflow that was created. We created all required elements and workflow. As next step, we will create several dashboards using EPM Pulse and we will integrate them into the PDPs that we created, so on every stage the corresponding dashboard will be displayed.